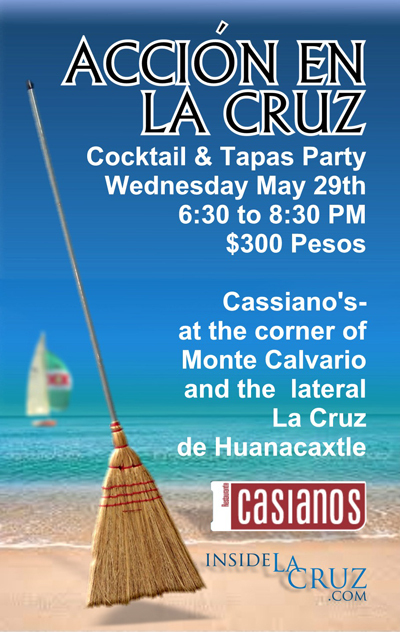 La Cruz’s “hidden culinary gem,” Casiano’s (formerly Il Violli) will host a special Cocktail & Tapas Party to benefit the Acción En La Cruz program on Wednesday May 29th at 6:30 PM. The special evening will feature a unique sampling of Chef Carlos Rojas’ signature tapas and the ticket price of $300 pesos also includes 2 glasses of either wine, beer, mixed or soft drinks. The unique restaurant will also offer special dishes at a special price for sale “beyond the tapas”. The complete menu can be found at the end of this article. “Hiding in plain sight” at the corner of the incoming lateral and Calle Monte Calvario in La Cruz, Casiano’s remains somewhat of an enigma to many local residents due to the “concept” of the restaurant and their accompanying side business; a catering company. 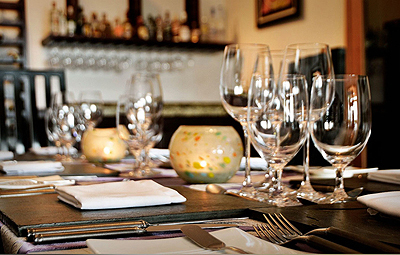 Due to catering contracts and obligations, the restaurant staff is frequently off-site at functions around the Bahia but the restaurant may be perceived as closed. On most nights, lucky guests will discover a truly unique dining experience at this intimate spot. The brainchild of Chef Casiano Reyes, the first two restaurants were opened in Cabo San Lucas and San Jose del Cabo, Baja California, moving here to a 3rd location two years ago. Each night a custom menu is created from the freshest local produce, seafood and meats available as a prix-fix three course or five course meal. The special event that Chef Carlos and Manager Enrique have put together for Acción En La Cruz will be a very special chance for many guests to try this culinary haven for the first time. This evening will help to restart the Acción En La Cruz program (called both Action and Work for Food previously) which has been in hiatus since March due to funding problems caused by the changes in The PEACE organization and lost backing from Amigos de La Cruz. In order to continue the program in La Cruz, an interested local non-profit partner was sought and program advocates are pleased to announce that henceforth, La Fundación Punta de Mita will manage all financial and tax obligations as well as receive all donations and contributions to the program. Part of the contract for this alliance is that the program have an initial operating fund of $25,000 pesos, which is are very close to achieved with $9,000 pesos from TASTE OF LA CRUZ and a generous donation of $10,000 pesos from a local altruistic organization. Extremely well-received and popular, the program has provided over 400 families in La Cruz with food staples for 10 meals in return for 2 hours of work over the last 2 years. The organizers will be working closely with the La Cruz Delegado to lend direction for the workers which fit into the town’s proclaimed plans to be the cleanest Pueblo in the Bahia!